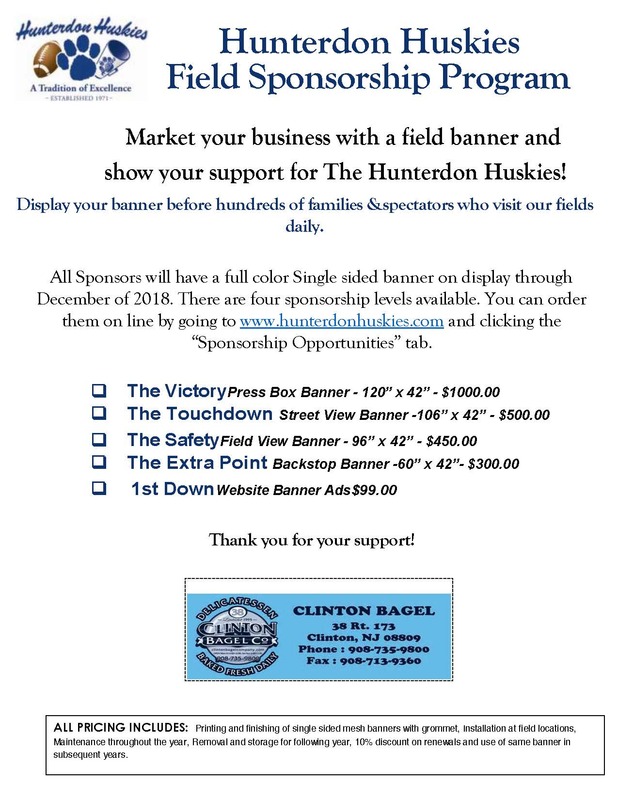 The planning is underway for another successful campaign for the Hunterdon Huskies! The Huskies is a non-profit 501(c)(3) corporation, receives no funding from any municipalities for any of the costs to operate our programs. We therefore rely on registration dues and fundraising efforts to support and manage both our Football and Cheerleading programs. Your support in past seasons has been greatly appreciated. The Huskies are now asking for your continued support for the 2018 season. New advertisers: please click here to fill out the online registration form so that signs can be completed by the start of our season. For Renewals when using the same banner only, please click here to submit an annual renewal.